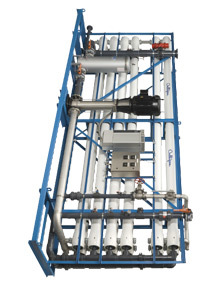 Culligan designs specialty, high-efficiency, and high-purity water reverse osmosis systems to solve the most common problems for a variety of industrial and commercial water treatment processes. Clean up your water with a Culligan RO system. In Reverse Osmosis, water is passed thorugh a semi-permeable membrane under high pressure, removing unwanted dissolved solids. This process eliminates up to 95% of dissolved minerals, particles and organics from your water, giving you pure water for anything from making beverages to printing. From 100 gallons per day (.07 gpm) to 144,000 gallons per day (100 gpm) Culligan has an RO system to meet your needs. 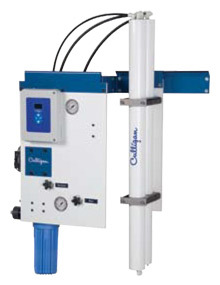 Culligan also offers specially engineered reverse osmosis systems for use on your commercial/industrial needs. The E1 Reverse Osmosis System is an economical water treatment solution, which reduces operating and post treatment costs. The E1 Reverse Osmosis system helps you reduce maintenance costs by reducing contaminants* from your water that affect taste and clog equipment. Control your installation costs by using a system configured for your unique needs. Keeps your operating costs low with an easy-to-use electronic controller. When you install a G1 Reverse Osmosis system, you combine cost-effective system configuration, cost-minimizing operations, and reduced post-treatment costs. The G1 Reverse Osmosis system helps you reduce maintenance costs by reducing contaminants* from your water that affect taste and clog equipment. Control your installation costs by using a system configured for your unique needs. Keep your operating costs low by monitoring and changing the G1 RO settings with an easy-to-use electronic controller. Purchasing a G1 RO is more than a sound business decision—you improve the quality of life for your building. Culligan® makes it simple to manage your water for drinking and industrial processes. The G2 Reverse Osmosis system is a flexible, expandable configuration customized to help meet your most demanding and exacting consumption needs. Manage the reverse osmosis system using an easy-to-reach electronic controller that automates when to get the quantity and quality of water based on your specific requirements. industrial processes by reducing contaminants* that corrode and clog equipment, so your investment in the Culligan G3 RO benefits your operations for years to come. 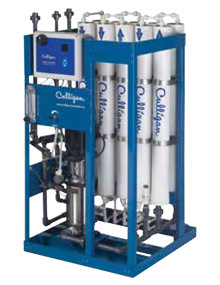 From membrane reverse osmosis to deionization and commercial water softening, and from design to installation, Culligan's fast-to-market solutions feature revolutionary designs for commercial water treatment that are completely customizable to your business needs. Utilize Culligan’s chemical water treatment programs to prevent corrosion, deposition, and microbiological growth in your Cooling and Heating Systems. Protect your cooling towers and chillers, steam boilers and steam lines, closed loops and equipment, all while minimizing water and energy consumption, facilities costs, and downtime. Culligan offers a variety of solutions for any water conditioning challenge including waste water applications, acid cleaning, and water reclamation.